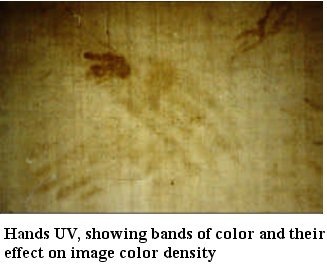 Bands of slightly different color can be seen in Shroud photographs. They are most visible in ultraviolet-fluorescence photographs (see Hands UV). Both warp and weft yarns show this property. Some areas show darker warp yarns and some show darker weft yarns. In some places bands of darker color cross. In other places bands of lighter color cross. The effect is somewhat like a plaid. All of the bleaching processes used through history remove lignin and most associated flax impurities (e.g., flax wax and hemicelluloses). The more quantitative the bleaching process the whiter the product. The bands of different color on the Shroud are the end result of different amounts of impurities left from the bleaching process. Where darker bands of yarn intersect image areas, the image is darker. Where lighter bands intersect an image area, the image appears lighter. This proves that the image color is not a result of reactions in the cellulose of the linen. Some impurities on the surface of the different batches of yarn produced the image color. This observation is extremely important when tests are being made on image-formation hypotheses. If image color is not simply a result of color formation in the cellulose of the linen fibers, image formation must be a much more complex process than we originally thought.